At this year’s 7th International Parliamentarians’ Conference on the Implementation of the International Conference on Population and Development (ICPD) Programme of Action (IPCI), UNFPA’s strategic partner Canada demonstrated its continued leadership in creating an enabling policy and funding environment for gender equality and sexual and reproductive health and rights worldwide. 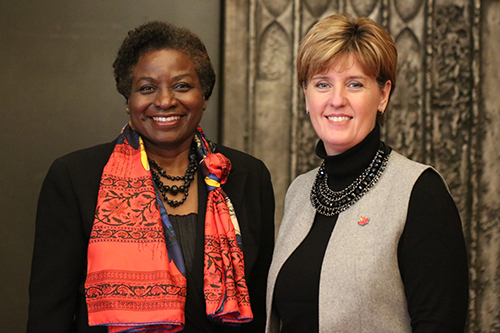 The IPCI, held on 22-23 October 2018 in Ottawa and co-hosted by UNFPA, Global Affairs Canada, the Canadian Association of Parliamentarians on Population and Development, and Action Canada for Sexual Rights, brought together more than 130 parliamentarians and experts from over 70 countries. The work of parliamentarians in adopting new legislation, strengthening policies and mobilizing adequate funding for sexual and reproductive health and rights in their respective countries is critical to accelerating the goals set in the 1994 ICPD Programme of Action – and indispensable for achieving the Sustainable Development Goals. In the IPCI outcome document, the Ottawa Statement of Commitment, parliamentarians pledged to work towards ending preventable maternal deaths, unmet need for family planning, and gender-based violence and harmful practices. The parliamentarians paid special attention to the rights and prospects of young people, and also focused on addressing sexual and reproductive health and rights in humanitarian and crisis situations. The action-oriented declaration included commitments to advocate for the provision of accessible, high-quality sexual and reproductive health care, to adopt legislation that eliminates harmful practices, and to dedicate at least 10 per cent of national development and development assistance budgets for sexual and reproductive health programmes. The focus of IPCI directly aligns with the goals set out in the UNFPA Strategic Plan for 2018-2021 – as well as with Canada’s approach to international development cooperation and humanitarian assistance, articulated in its Feminist International Assistance Policy, which puts gender equality and women’s empowerment at the centre. A proactive advocate for the rights and goals articulated in the ICPD Programme of Action, Canada has been a longstanding partner of UNFPA and continues to make significant investments in women and girls. In 2017, Canada was the eighth biggest donor for combined contributions to UNFPA (taking into account both core resources and co-financing), and in 2018 increased its co-financing support by more than 370 per cent, to $104.4 million. Most recently, Canada announced a new contribution of CAD10 million to UNFPA Supplies, to ensure access to contraceptives and maternal health medicines for the world’s poor and marginalized women and girls. Canada is expected to continue to take an active role around discussions on gender equality and sexual and reproductive health and rights in the lead up to next year’s 25th anniversary of the ICPD (ICPD+25). Throughout 2019, the international community and UNFPA will reflect on progress and gaps in implementing the Programme of Action adopted in Cairo in 1994. Amidst the challenges posed by rising inequality worldwide, accelerating progress to wrap up the unfinished business of the ICPD will require a strong focus on the rights and needs of those at greatest risk of being left behind. This report makes the clearest and strongest case to date why population issues must be integrated in the new development agenda.